Our raspberry canes at the allotment have been full of ruby fruity jewels this month. It' such a treat to have such delicious soft fruit at this time of year. The only problem is that when you have such a bounty you need to keep finding ways to use the raspberries. As they are probably the softest of the soft fruits they don't keep for very long – especially since ours are not spread or treated with any chemical nasties. 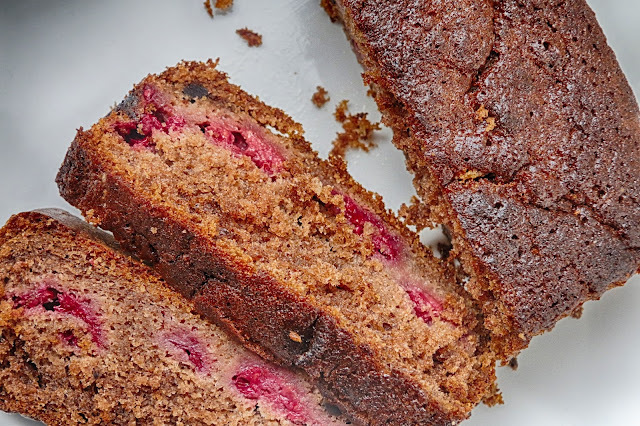 After Mr JibberJabber brought a haul of raspberries back from the allotment he declared he fancied some baked in a chocolate cake. I thought a loaf cake would be the quickest and easiest cake to make. After gathering together all the ingredients I then realised I barely had any cocoa powder left. As it was after 4pm on a Sunday afternoon I knew the only cocoa powder that I would be able to get would be at an expensive little shop a drive away. As I didn't want to splash the cash or head out anyway I thought I would just reduce the amount of cocoa in the recipe anyway. It still provides a good chocolate hit while letting the taste of the raspberries come through. If you want a stronger chocolate taste then do add some more cocoa powder but it wasn't noticed here and the cake was gone in a day! Equipment: 2lb (1kg) loaf tin greased and lined, 2 large bowl, electric whisk/beaters. 1. Put the raspberries in the fridge to chill while you prepare the rest of the cake. 3. Cream together the butter and sugar until pale and fluffy. 4. Beat in the eggs one by one followed the milk. 5. In another bowl combine the flour, cocoa and baking powder. 6. Fold the flour mixture into the other mixture making sure it all combined. 7. Put half of the mixture in the prepared tin and then put the chilled raspberries on top. Cover with the rest of the mixture. 8. Bake for 50 minutes until a skewer comes out clean of cake (it may have raspberry juice on it). 9. Remove from the tin and leave to cool on a wire rack.